Cleanliness: A clean working environment is essential in the prevention of contamination in working with pasta and other foods. Be sure to wash hands thoroughly before handling the pasta dough. The work area, cutting boards, and utensils must be clean. 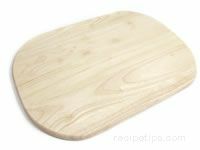 Do not use the same cutting board for cutting pasta as was used for raw meat or poultry unless it has been properly washed and dried before using. When you are finished making the pasta, be sure to clean the work area and all utensils thoroughly. 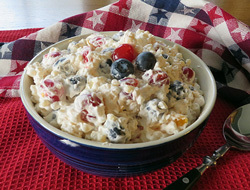 The eggs in the dough are a potential risk factor for salmonella. Cleaning the area with hot soapy water will help eliminate traces of the bacteria. If you have used any type of pasta machine, be sure that you clean it thoroughly when you are done. Remove all traces of dough. So not use water to clean a hand-cranked machine because the water will cause the machine to rust and become unusable. See the manufacturer's user manual for the best way to clean whatever type of machine you use. 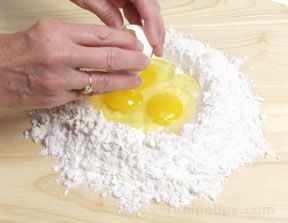 Handling: As with any dough that contains raw eggs, fresh egg pasta dough should never be tasted when it is raw. It is also important that the eggs used in the dough have been handled and stored properly. Use the freshest eggs possible. Eggs should be stored in the refrigerator in the carton they were packed in. Eggs should be stored in the coldest part of the refrigerator where the temperature remains constant. Eggs keep best when they are stored at temperatures of no higher than 40°F. The ideal temperature range is 33°F to 38°F. Although salmonella bacteria is not destroyed in temperatures below 40°F, any of the bacteria that may be present will not grow. Handle all equipment and utensils with care to prevent injuries from happening. Be extra careful when coming into contact with the blades and dies on the pasta machines. 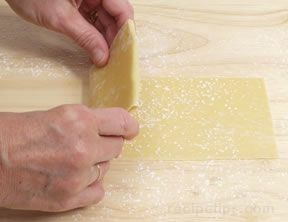 When you are cutting homemade pasta by hand, be cautious when using sharp knives. 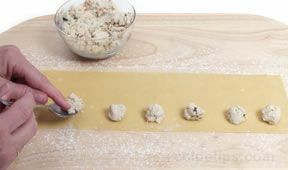 If holding the pasta in place with one hand while cutting with the other, be sure that the fingers on the hand holding the pasta are turned in towards the palm of the hand rather than pointing towards the blade of the knife. When boiling the pasta, use standard safety precautions. Keep pot handles out of the way so that they don't accidentally get bumped, causing boiling water to be spilled. Use potholders to protect your hands when handling pots that do not have heatproof handles. When checking pasta for doneness, be sure to cool the pasta before tasting. Be extremely careful when pouring boiling water and pasta into the colander for draining. It is best to cook no more than one and a half pounds of pasta at one time because that much pasta and the boiling water it takes to cook it makes it too difficult and unsafe to handle. Uncooked dried pasta is stored differently than uncooked fresh or homemade pasta. 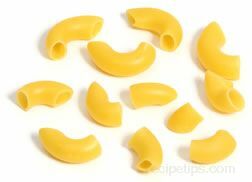 Cooked pasta, whether it is dried or fresh, is stored in the same manner. Uncooked and cooked pasta have several options for storing. The storage options for each are shown below. Dried Pasta: Dried pasta does not need to be refrigerated. 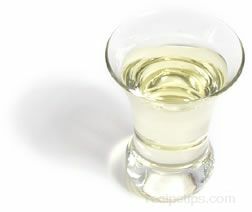 It can be stored on the shelf in an airtight container in a dry area that is not exposed to extreme temperatures. Dried pasta can be stored indefinitely and still be safe to eat but the USDA recommends storing dried pasta for no more than two years to obtain the best quality. Some manufacturers will stamp their packages with a "best if used by" date, which indicates that the flavor, color and nutritional value may be affected if used beyond that date. Fresh and Homemade Pasta: Fresh pasta can be stored in the refrigerator for 2 or 3 days. 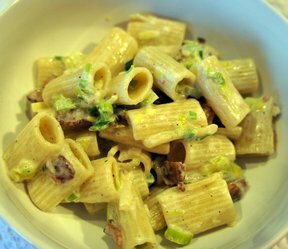 If the pasta will not be used within that time, it can be frozen and stored in the freezer for 2 to 3 months. 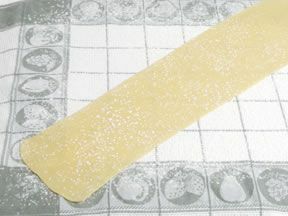 Homemade pasta can be store in the refrigerator for 1 or 2 days or frozen for 2 to 3 months. 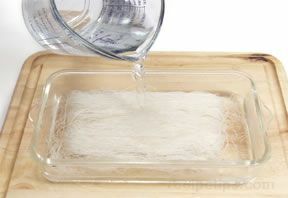 Homemade pasta can also be allowed to dry thoroughly and then placed in a plastic bag or airtight container. The length of time it will take to dry will vary depending on the type of pasta and its size, shape and thickness. 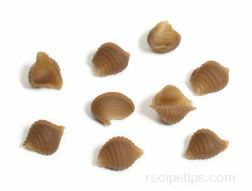 If dried completely, the pasta can then be stored in a cool dry place for a couple of months. 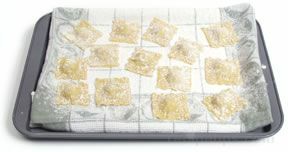 If you are going to be using the pasta the same day as it is made, you can allow the pasta to dry on a clean towel for a couple of hours before you cook it unless it is stuffed pasta. 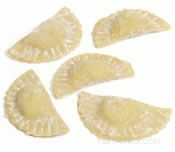 Stuffed pasta, such as ravioli, should be cooked within half an hour, otherwise the pasta will begin to discolor and become damp. If it is not going to be cooked immediately it should be place on a lightly floured towel that is placed on a baking sheet, sprinkled lightly with flour, and then placed in the freezer. 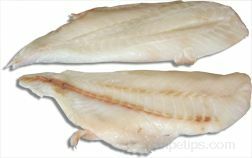 Once they are frozen they can be stored in a freezer proof bag or wrap and then stored in the freezer for 8 or 9 months. Frozen pasta does not have to be thawed before it is cooked. Just throw the frozen pasta into boiling water and let it cook. It will need to cook a little long than unfrozen pasta. Cooked pasta can be stored unsauced in an airtight container and refrigerated for 4 or 5 days. The sauce should be refrigerated separate from the pasta and can be stored for 6 or 7 days. This prevents the pasta from soaking up too much flavor and oil from the sauce, which causes the taste of the pasta to be drowned out. If the pasta is stored together with the sauce, it should be eaten within 1 or 2 days to limit the amount of sauce that is absorbed. If cooked pasta is not going to be used within the suggested time period, it should be frozen and then it can be stored for approximately 3 months. 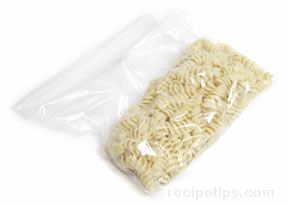 Frozen cooked pasta should be thawed in the refrigerator and not on the kitchen counter. To store, cook the pasta as you normally would and then rinse with cold water and allow it to drain well. 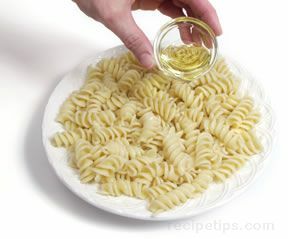 Add a small amount of olive oil or butter to help prevent the pasta from clumping together while it is stored. Use only enough oil or butter to lightly coat the pasta. 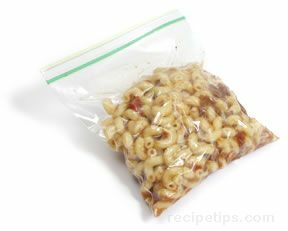 To refrigerate, place the pasta in an airtight plastic bag or an airtight container and place in the refrigerator. 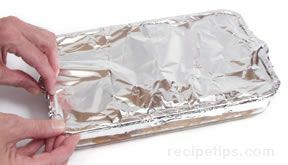 To freeze, place in an airtight plastic freezer bag and press out as much excess air as possible and place in the freezer. 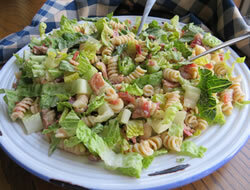 If storing sauced pasta, eat within 1 to 2 days to prevent the pasta from absorbing to much sauce. When refrigerating or freezing cooked pasta, be sure it is stored in a well sealed container so that it does not absorb any odors. Cooked lasagne and baked pasta dishes can be refrigerated or frozen in the same manner as plain cooked pasta. The lasagne and casseroles should be first cut into individual servings before placing them in a sealed bag or container. This will make it easier when reheating. If you have an entire lasagna or pasta dish to refrigerate or freeze, it can be left in the baking dish and tightly covered before storing. The lasagna and baked pasta dishes can be refrigerated for 3 or 4 days or they can be placed in a freezer and kept for approximately 3 months. If frozen, the pasta dish should be thawed in the refrigerator and not on the kitchen counter.